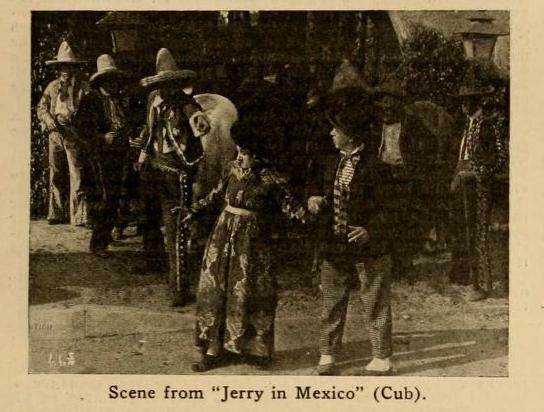 Sobre esta cinta, Jerry in Mexico (1915), García Riera en su clásica obra México visto por el cine extranjero (Ediciones Era/Universidad de Guadalajara, 1987) no hace mención alguna sobre ella. Sin embargo, sí menciona Jerry and the Gunman (1915) de la misma casa productora, Cub Comedies, y con el mismo protagonista, George Ovey. La brevísima ficha filmográfica (pag. 52) indica que “[u]n bandido mexicano asalta un banco.” El comediante George Ovey personificó a Jerry en más de 80 cortos (2 rollos), los cuales se filmaban a un promedio de uno por semana; desde The Stolen Case de 1915 hasta Jerry’s Best Friend de 1917. Más allá del hecho que el bandido es mexicano, Black Gomez – el perfil cotidiano del malo en los westerns de la época muda era en la inmensa mayoría de los filmes un mexicano con un obvio mensaje racista –, resulta curioso que el protagonista se enamore de la bailarina mexicana y sale despavorido cuando está a punto de casarse con la hija del granjero, representación clásica de la pureza protestante, contrastada con la idea del americano promedio tiene de la belleza exótica de la mujer mestiza, mujer de la cual se enamora. Aunque que el último reseñista, tal vez por ser el personaje una bailarina, la considera española. También es notorio el doble papel que interpretan algunos actores. Las siguientes tres reseñas no traen firma, sin embargo por su contenido, una fue escrita por alguien que vio la película y relata de forma general la trama. Una segunda la escribió algún redactor de la revista y la tercera reproduce un memo oficial de los estudios productores. La última reseña recomienda quitar algunos “toques vulgares” del filme, sin mencionar cuáles son éstos. Pero la alaba como una “buena película.” A continuación las tres reseñas y un fotograma del filme. The adventures of Jerry, the principal character in the Cub Comedy releases, whose proclivities continually get him into trouble, are continued in the Cub Comedy scheduled for release on the Mutual program for January 21. The picture is called “Jerry in Mexico” and transfers the scene of Jerry’s troubles from the states to the country just across the border. George Ovey plays Jerry in this as in all other Cub pictures. Jerry has found the states too hot for him, after a series of painful incidents, and decides that Mexico offers a haven of rest. Instead it proves just the opposite. His trouble begins when upon entering a Mexican cafe the Mexican belles insist upon making him the object of their affections. Were it not for the objections of the girl’s sweethearts everything would have been glorious for Jerry, but being hot tempered creatures the aforesaid sweethearts proceed to show their rights. Then Jerry goes through a series of exciting adventures which terminate only when he is able to make his way to safety back into the states. The story as outlined has been worked into a number of rapidly occurring comedy situations, which Director Milton Fahrney has staged in his best style. George Ovey brings forth his usual number of laughs. His supporting company includes Jefferson Osborne, George George, Janet Sully, Belle Bennett and a host of supernumeraries. JERRY IN MEXICO (Dec. 31). – The cast: Jerry (George Ovey); Black Gomez (George George); Sheriff (Jefferson Osborne); Mexican (Jefferson Osborne); first Mexican (Louis FitzRoy); second Mexican (Arthur Jackson); third Mexican (Joseph Von Meter); Farmer Brown (Robert Kenyon); Butler (Arthur Jackson); Bartender (Gordon MacGregor); Constable (Gordon MacGregor); Juanita (Belle Bennett); Agie (Louise Horner); Mexican Woman (Janet Sully). Jerry has lost his job in the movies and is chased out of the United States into Mexico. He sneaks back over the line. His only support is a tree against which he is leaning. Here he reads and appropriates for future use a notice tacked thereto which offers a reward of $500 for the capture of Black Gomez, a bandit. At the boundary line post, one side reading “U. S.” and the other “Mexico” he meets Farmer Brown who is staggering along the road under a heavy load of trouble. Jerry learns that Gomez has captured Brown’s daughter Agie and robbed him; if Jerry saves his daughter he may have her for his wife, and Brown produces her photo. Jerry throws a sickly smile when he looks at it. With the reward in mind Jerry promises Brown, leans exhausted against the sign post, which, not being well secured, turns as he keeps turning with it, until the signs are in reverse position. boldly attempts to leave the house through the only exit, the barroom, but is chased by the irate Gomez and his pals. He evades them, returns and plants a ladder at what he believes Juanita’s window. Just as he reaches the top of the ladder Juanita lets fly the contents of a water pitcher onto his head. Thinking he had made a mistake in the room, Jerry plants the ladder at another window, which proves to be Agie’s, for she had found the note and was read to flee and is heavily veiled. Close to the United States border they are held up by Gomez. Jerry points to the sign, Gomez is astonished to read “U. S.,” weakly yields his gun to Jerry and obeys orders to step over the line – but really into the land of the free. Meeting a constable a little further on Jerry tells him about Gomez being in the reward. With Agie still veiled Jerry hurries to a Justice of the Peace, but when she raises her veil he is almost prostrated, but manages to make a safe getaway on a constable’s bicycle. JERRY IN MEXICO (Cub), Jan. 14. – This is a very acceptable farce comedy featuring George Ovey. A few rather vulgar touches might well be eliminated, but barring these, the picture will be found to be a good one. It treats of Jerry’s journey across the border line of Mexico to rescue the daughter of a farmer, who has been kidnapped by bandits. Jerry falls in love with a pretty Spanish dancer, but in trying to elope with her makes a sad mistake and gets the homely daughter of the farmer instead of his sweetheart.